Ezion is currently trading in a Down Trend Channel. The stock is forming a “Lower High, Lower Low” chart pattern. 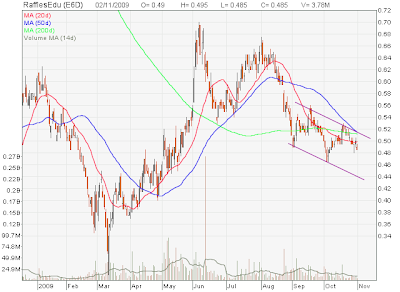 If the Down Trend Channel pattern is still valid, Ezion will probably go below $0.573 in the next few months. China HongXing looks like Breaking Out From A Down Trend Channel with an increase in a trading volume for the past two days. 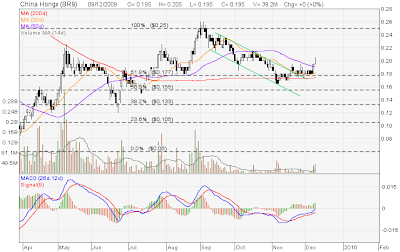 The stock price broke the 20D and 50D MA resistance, and MACD starts turning bullish. Immediate support between $0.18 to $0.19, next resistance at $0.215. Raffles Education is currently on a down trend channel. 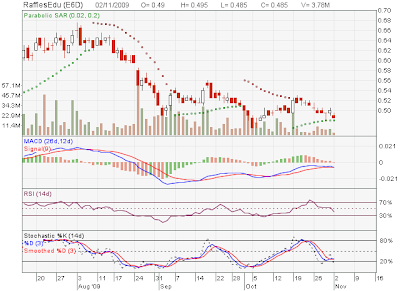 The stock price is under 20D, 50D and 200D MA which is a very bearish trend. Also note that 20D MA is currently under 200D MA implies great downward momentum in the short term. Technical Indicators like Parabolic SAR and MACD are near to show bearish convergence. RSI and Stochastic are heading down.